Earlier this week, a group of Australian banks applying to the Australian Competition and Consumer Commission (ACCC) for permission to jointly negotiate over access to Apple Pay and the Near Field Communication (NFC) function on iPhones, announced they have narrowed the application to solely focus on open access to the NFC function. “NFC” or Near Field Communication technology supports the short-range wireless communications between a retailer’s payment terminal and the contactless payment card, smartphone or other device being used to pay. The technology is inside all smartphones and all contactless-capable credit and debit cards. On the Android operating system, any installed application can access and use the open NFC function. However, on the iOS (iPhone) operating system, only Apple is currently allowed access to the NFC function. Bluechain believes that an ecosystem that is open to providing consumers, merchants and financial institutions with the right combination of convenience, security and cost with the selection of payment solutions is essential to mobile payment adoption and success. The latest payment technologies and real-time connectivity make it possible to provide secure payment solutions without the need for single-purpose secure hardware, such as POS terminals and card readers. However, to do this, these emerging mobile payment applications need to connect with existing payments infrastructure using the contactless (NFC), Bluetooth and Wi-Fi features embedded into today’s mobile devices. The security architecture of these new technologies can use whatever connectivity is available on the device. Bluechain, for example, utilizes Bluetooth, Wi-Fi and mobile comms (SIM card) to secure and optimize the speed of the transaction between the customer, the merchant and the payment server. At present, Bluechain doesn’t use NFC because Apple has restricted access on the iPhone. But if we had access to the complete range of NFC modes, it would allow us to offer customers a wider choice of payment methods. 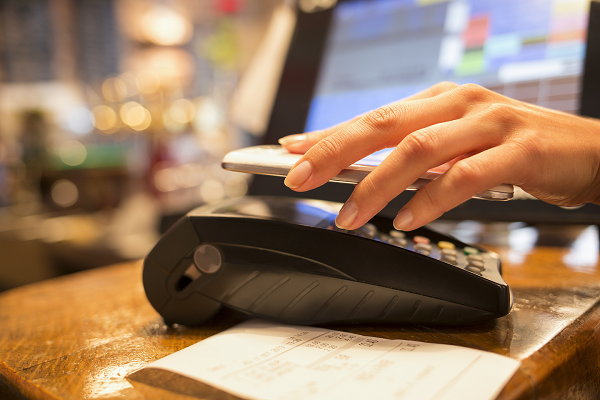 Most other mobile payment solutions, however, rely solely on contactless technology and existing contactless readers. These solutions require unrestricted access to the NFC interface on mobile handsets. And so any attempt by major device manufacturers to restrict access by third-party solution providers to NFC (or other mobile services, such as Bluetooth, Wi-Fi, location, biometrics, etc.) is clearly anticompetitive and definitely not in the interests of consumers.